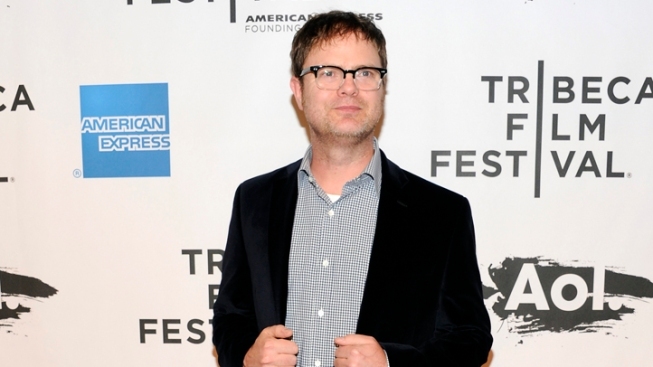 Actor Rainn Wilson posted a spoof video to his Facebook page Tuesday, calling his hit NBC comedy "The Office" "filth." Angus T. Jones, 19, posted a similar, but totally serious video Monday bashing his own CBS show, "Two and a Half Men." Angus T. Jones isn’t the only one who thinks his TV show is “filth.” Rainn Wilson is convinced “The Office” will “rot your brain” as well. Wilson, who plays Dwight Schrute on the NBC series, posted a video to his Facebook page Tuesday in which he mocks a totally serious rant made by “Two and a Half Men” star Jones in a similar video making the Internet rounds, Us Weekly reported. Wilson, with costar Craig Robinson, says, “Dwight from 'The Office' is nothing, OK? 'The Office' is nothing, all right? If you watch 'The Office,' please don't watch 'The Office.' I'm on 'The Office.' It's filth. And that filth will rot your brain." On Monday, Jones made similar comments in YouTube video of his religious testimony with Forerunner Chronicles, a group linked to the Voice of Prophecy Seventh-Day Adventists church. In it, Jones, 19, details his religious awakening and criticizes the show that made him famous. Jones has played Jake Harper on the CBS series since its debut in 2003.